Here's a shot that will stun your friends and opponents. It's also a great alternative to have when you're faced with one of the game's toughest assignments - the long bunker shot. When most golfers are called upon to hit a greenside sand shot of 15 meters or more, they resort to a sort of power blast, taking a huge swing while also trying to minimize the distance they hit behind the ball. For obvious reasons, that is a risky shot. To pull it off, you need a lot of talent and a lot of guts. As an alternative, I've developed a sort of secret weapon - the slicing 8-iron. You can't hit this shot when you have a high lip to clear, but in all other situations I think it's a better shot than the big explosion. Basically, the idea is to make a big shallow cut across the ball, and slice it to the green, where it will spin to the right. You begin by setting up in an extremely open stance, while also allowing for the slice by aiming a bit left. As a result, your body will be aligned farther to the left than for any other shot in the game. The 8-iron also will be wide open and laid back, with the ball positioned off your left instep. Figure on opening the leading edge of the clubface about 45 degrees from square-Grip the club at its full length, and don't be afraid to make a full swing at the ball. Just be sure that you strike the sand at least a few centimeters behind the ball. Don't worry about digging in for too much sand - your ball position and open clubface will prevent that. 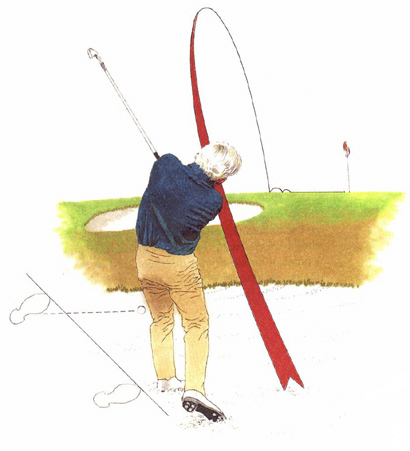 If you hit this shot properly, the ball will take off well left of the target and fade slightly before it hits the green. Then watch what happens. It will take one bounce, after which the sandpaper sidespin you've applied to the ball will take effect, and the ball will scoot to the right faster than any other shot. The first time you pull this off, you'll amaze yourself. After that, you'll amaze everyone else.